Miguel based on the response thus far we won’t need to reserve any tables huh? I'm interested in biscuits, coffee, and meeting y'all. Daughter and SIL live in Walton County. I'm 78 and if I make this coming season it will be my 68th season of deer hunting and I've killed lots of bucks and I don't intend to quit until they pat me in the face with a spade! I don't look a bit different from this photo my son took of me with a buck in 2014 for better or worse however it may be received! And I'm gonna do my best to stick a .58 caliber PRB through this dude's rib cage when season opens! You old geezers be careful if you are going out hunting in this heat. this is my first year hunting the left coast. base elevation, iirc, around 4k feet. peaks 8-11k. hoping things go well. just figure to go slow, and see how this big old fat boy does with a scouting trip this weekend. thankfully, it's only mule deer, as opposed to mountain sheep. but i am thinking these places will make cohuta and war woman look like flat land. i reckon if i gotta go, doing something hunting related would be the way to do it. looking like the temp range will be 50-90 this weekend. All this points to an aging hunter population. Let's all do our part to recruiting some new young hunters. I just don't get all this "We need to recruit new... this or that." Need millennial Harley riders, we need to get the kids hunting, we need what ever. If you have to recruit, I'd rather they just stuck with golf. No one ever recruited US. We just saw something we wanted to do, learned about it and started doing it. If people don't want to do something I like, I say GOOD. Leave it alone. I am 80, bow only, hunt alone, hunt several different places, use Summit climbers and PSE bow. Car loaded and ready to go several times a week for four months. I’ll be 62 this season. 20’ up suits me fine. I hunt Illinois by myself and think nothing of it, in fact - I like it. I’d like to rock along another 20 years so BowArrow is an inspiration!! I'm 57 the fire is still burning but will have to admit it has wained some but still enjoy going and watching the son and grandson enjoy hunting. It warms my heart when just the other day they come to me and said PaPa the the other grandson calls me Pop Pop " we are ready to go to the farmhouse" that's what they call the Hunting prop. I guess time goes on and it's time for the young bucks to take over. But I'm going to hang with them as long as I can. Well, will be 77 next month. Hunt from ladder stands but remove one section so not as high. Hunt with crossbow and killed a doe opening day last year. Saw nothing this past Saturday morning. I'll be out there as long as the good Lord allows me to be. Good hunting to you seniors! 61 and still get after it. Gave up lock on stands a couple years ago, just to dangerous hanging by myself. I will be there until I can't. Just purchased my Senior Lifetime license today. My son bought me my first new deer rifle in 40+ years as a gift. Can't walk quite as fast as I used to, but still using ladder stands and ground seats just like always. Going to keep after them as long as I can and love spending time with my sons and grandsons in the woods. 55 tomorrow. 09/12 and still go just like always. 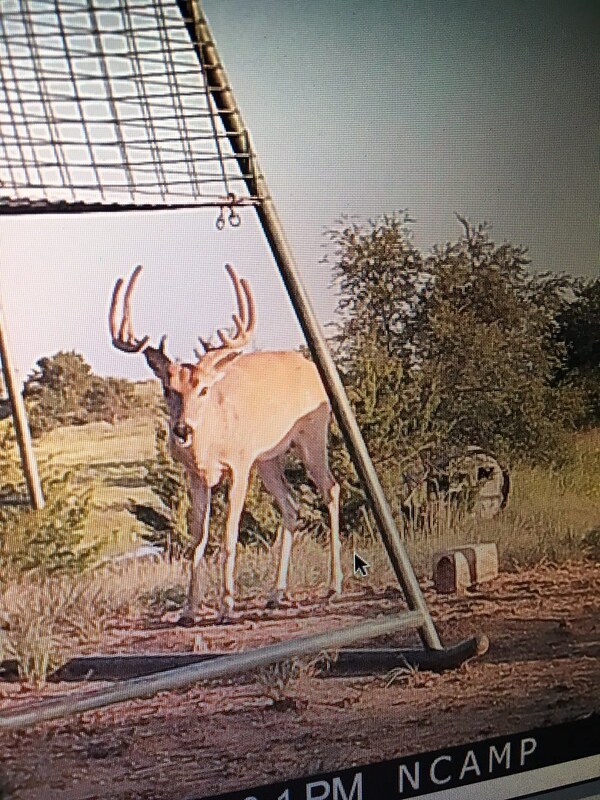 I get a bit aggravated finding good properties that hold quality deer. But still have my holes that at least have some deer. It is a bit harder to hunt the highlands like I did but I still hike a few ridges. 64 here. I hunted opening day on new property. Had a spike in velvet feed under me for 18-20 min. Watched him walk off feeding in a new cut area. Still enjoy getting after them. The heat reminded me that I did not reduce enough in the off-season as was my goal LOL. My ole blue hunting truck stays loaded to go. Here is a pic from last bow season. I had pretty much given up bow hunting until my oldest grandson got interested. The day I got this buck was the first time he and I ever bow hunted together. I put him on what I felt was the best place. But as it worked out I was in the right place at the right time. September 16, 2017. But being older and having a grandson to encourage me worked out. Nice buck and even better memories.